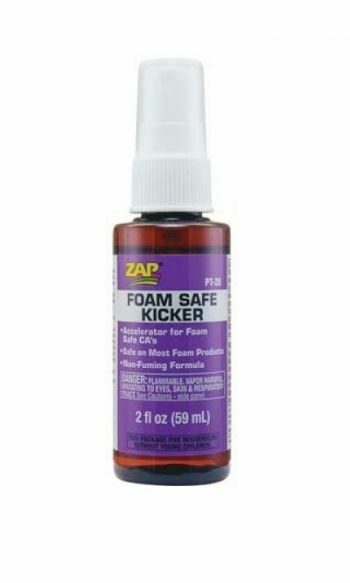 Zap Adhesives Foam Safe Kicker 2 oz. This is 2oz bottle of Pacer Foam Safe Kicker with Pump. Safe on most foam products. Compatible with most other Foam Safe CAs. Works on Balsa, Spruce, Plywood, Plastic and Metals, etc. Forces most CAs to cure in 10 seconds or less. Increases Gap filling and fillet forming compatibility. Use with CA foam safe glues.